Let’s travel to Africa and learn about the Ghana! My 1st grader made a fun kente cloth craft with the rest of the kids in his art class. It can easily be adapted for preschoolers as well as slightly older elementary aged kids. It’s a beautiful hand woven cloth that features geometric shapes, bold designs, and bright colors. The design of kente cloth and each pattern has a specific meaning, relating to the history or beliefs of the Ashanti people. The collection of patterns on a single cloth hold a different symbolic meaning. 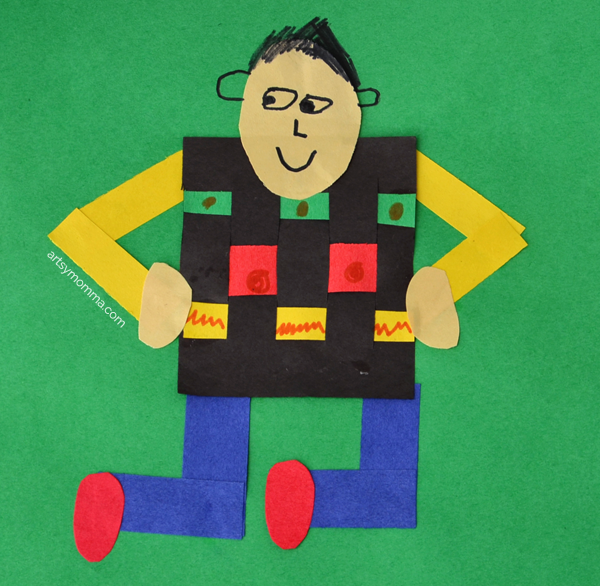 This kente cloth art project is a simple way to introduce kids to African culture. 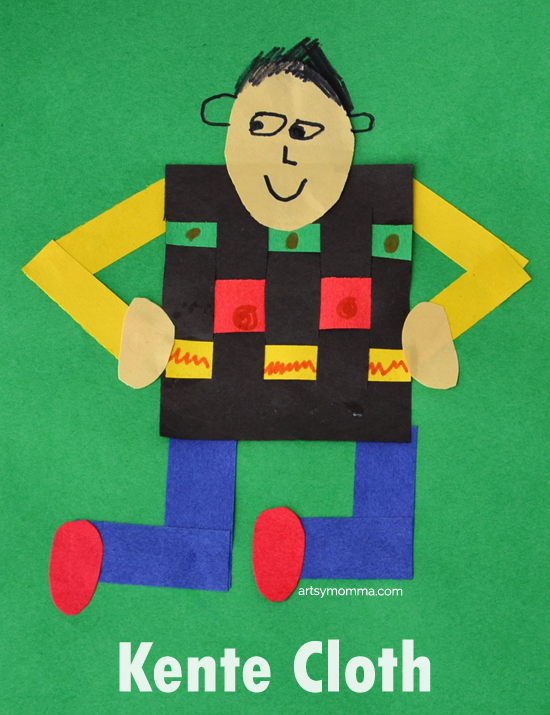 For this project you will need construction paper, scissors, glue, and markers. First, cut a square from black paper. Fold the square in half, then cut 4 slits equally spaced apart and stopping about an inch from the edge (distance will vary depending on the size of you square). Cut a strip of red, green, and yellow construction paper. Have the child weave the first strip alternating over and under method. Do the next strip starting under if you started the first with over or vice versa. Weave the last strip starting with over (or vice versa). Glue the woven square to a sheet over paper. My son’s class used green. See what each of the kente cloth colors represent here. Cut 4 blue strips for the legs and 4 thinner yellow strips for the arms. Glue the pieces in place. The arms on my son’s form a sideways ‘V’ and the legs form a backwards ‘L’ shape. Cut 2 small red ovals to glue on as shoes. Cut 2 small ovals from your choice of color for the skin and glue on as hands. Cut a larger oval from the same paper to make the face. Draw on facial features and hair. Draw designs on the kente cloth. This post is part of a fun series over at Cutting Tiny Bites where you can take a virtual trip to 30 countries in 30 days! 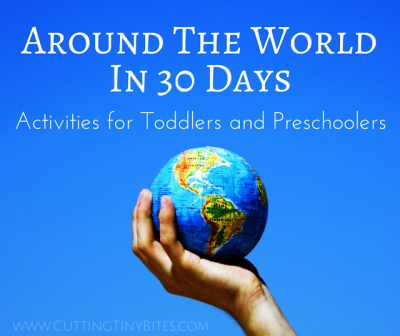 Many bloggers are sharing crafts, activities, recipes, and more from places all around world.